Jon has created the Chuckleberry Community and is discovering ways to make the farm more viable all the time. Chuckleberry operates as an off-grid organic farm with a year-round microgreen business, bringing farm-fresh microgreens to restaurants and retailers in the greater Nelson community as well as Creston, Castlegar, Trail, and Rossland. We also have extensive south-sloping organic gardens. These are used primarily to feed the community, but we grow and market some commercial crops including basil, garlic, and cherry tomatoes. Kristen Nammour’s involvement with agriculture started with a small balcony garden in Vancouver. She followed her love of growing to an apprenticeship with Sea Bluff Farm, a six-acre organic mixed vegetable producer in Metchosin. 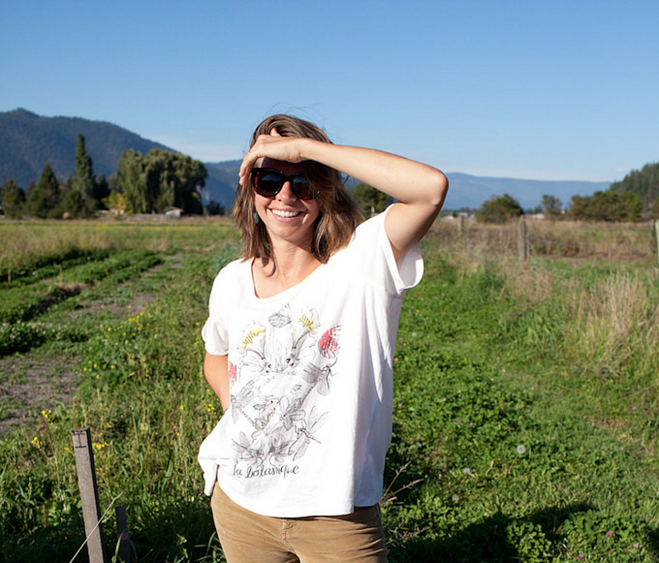 After some time as a field hand, she started her own mini market garden, 40×40 Farm, on Gabriola Island. Kristen has worked as a marketing consultant for a variety of food systems including a community supported fishery (CSF) and a food hub. In the winter, Kristen works with Young Agrarians, an organization dedicated to growing the next generation of farmers in Canada. As the BC Business Mentorship project manager she is able to combine her BBA in Marketing from Texas A&M University with her desire to help small sustainable farming businesses.